I’ve said it many times before, I love to paint birds, I love the intricate feather detail, the interesting colour patterns and the different textures and effects that one gets to experiment with. I captured the reference photo shot in The Kruger National Park a few visits back. Well actually, saying I “captured” the shot might leave open to interpretation that there was great skill involved in the photographic process when actually the lovely obliging Roller was sitting rather still, perched on a branch for quite some time, allowing me to take a ridiculous amount of photos, some of which were actually in focus and not half bad by my standards. Lilac-breasted Rollers are quintessential Kruger residents and their habit of perching in exposed areas whilst hunting means they make wonderful photographic subjects for even the least skilled photographer. 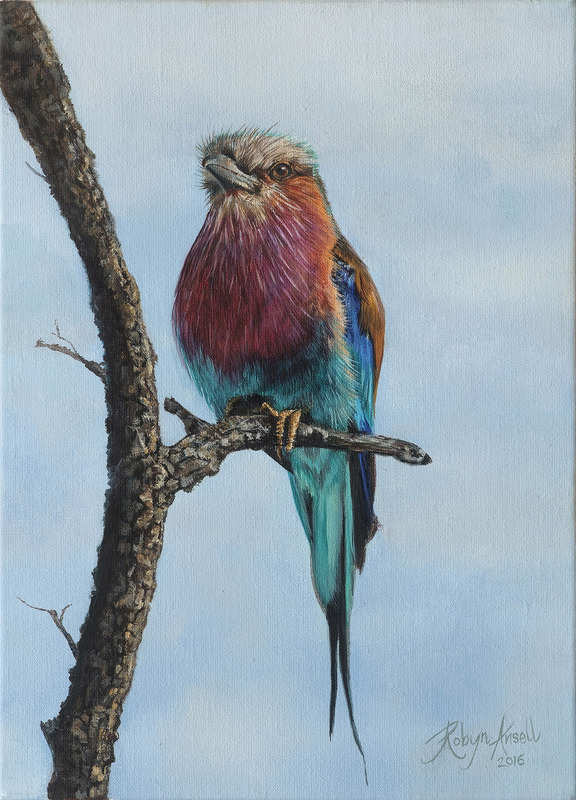 Of the countless failed attempts I have stored in my Kruger files, this one was perfectly acceptable, lovely feather detail, light in the eye, interesting posture, most definitely one I wanted to replicate on canvas.